I have an awesome product to show you. Chelsea from Pretty and Polished has new exiting items for cuticle care and she was so kind to let me try this one. We all know that to keep your hands being camera ready you absolutely have to take care of your cuticles. I have to admit that my cuticles have not always look the best - actually always look pretty bad. I struggle to keep them looking good since I also spend a lot of time working with paper and making jewelry which makes my hands very dry. Any who.....I have been trying this awesome cuticle balm from Pretty and Polish for about 4 weeks now. Here are my thoughts. i have been getting my little fingers in here a lot. 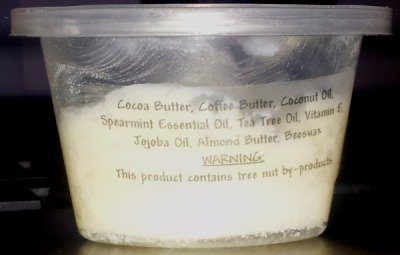 The scent is definitely much more minty less chocolaty than I expected, I really love the smell since I love minty scents but i would have loved it even more if there was more chocolate scent to it. Application was great, the balm melts on contact and has a lasting scent which I love. I like that it has made my hands and cuticles look great. Overall a great product! 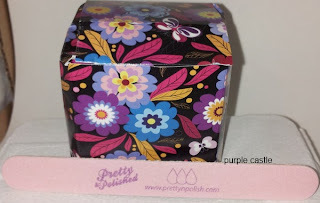 I love Pretty & Polished Nail polishes and this cuticle balm certainly does not disappoint I try this product on my left hand and on my right i tried a store bought cuticle oil which didnt work very well. Wow it really improved The way your cuticles look! Yay! It works :-), it's a real difference! Que bueno que te funcionó! Me encantó el packaging, y la fórmula se ve interesante para las cutículas. Me vendría de maravillas! ¡Yo también lo quiero!¡Feliz año nuevo! Wow! Sin duda se nota el cambio!!! Y todos los ingredientes que tiene son tan saludables!! Wow what a difference!! I am going to check it out now!! Hope you had a fabulous holiday season and New Year!! 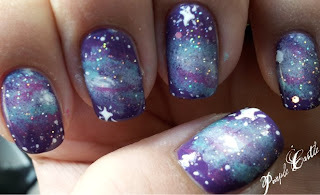 I love your galaxy mani! This balm seems like it would smell amazing!